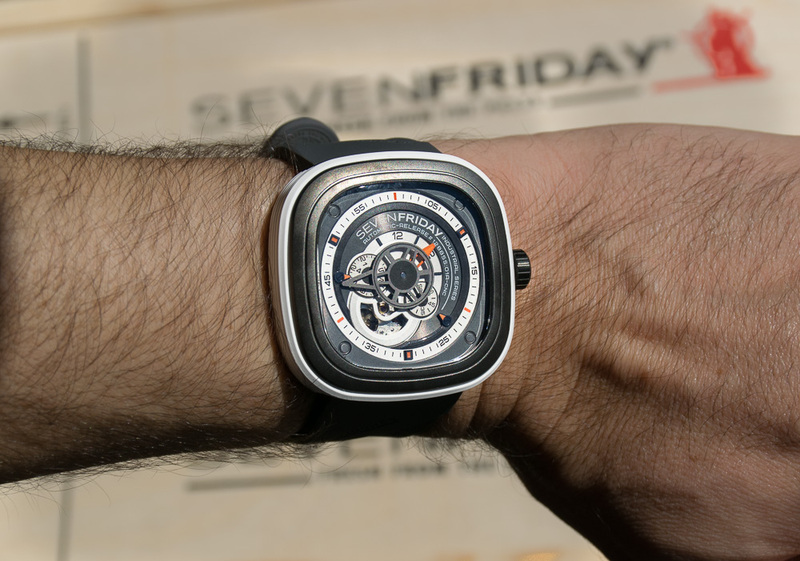 SevenFriday makes a unique watch with some largish dimensions: 47mm x 47.6mm. All their current models sit at 13mm thickness, which is pretty standard for non-chronograph automatic watches. Usually, if I hear a watch is 47mm, I know it won’t be suitable for my skinny 6.6 inch wrist… but these symmetrical pieces work. Since there are no visible lugs and it’s only 47mm in height, it works for my wrist! To start the comparisons, a standard Panerai Luminor 44mm is 53mm in height, from lug tip to lug tip, making it reach a fair 6mm more over your wrist than a SevenFriday. Smaller wrists might have lugs hanging over their wrist which can look off and cause the strap to fit awkwardly. The Chronomat Evolution is also 44mm, but not so high at 51mm. It should be noted our measurements (and almost everyone in the watch industry) do not include the crown. Compared to a good ol’ Rolex Datejust 36mm, it can look pretty big, but many of our customers would not wear the traditional Datejust anyhow. Me? I’d wear both! The Datejust has a height of 44mm so even that is not too far off from the height of a SevenFriday. The modern Submariner is 40mm wide and 48mm in height. The Omega Seamaster comes in a variety of styles and sizes with the Planet Ocean XL (now called the Big Size) is 45.5mm wide and 52mm tall, and a hefty 15mm thickness. The Tudor Pelagos sits a 42mm wide and 50mm high. From my observations of the watch size style trends in the US, the Pelagos has one of the best one-size-fits-all dimensions.. Something small wrists would be happy to wear just as much as large wrists. The Bell & Ross Instrument series comes in 3 sizes (S 39mm not shown). The BR 03 series is 42mm wide by 51.5mm tall. The BR 01 stands out at 46mm wide and 55mm from lug to lug! 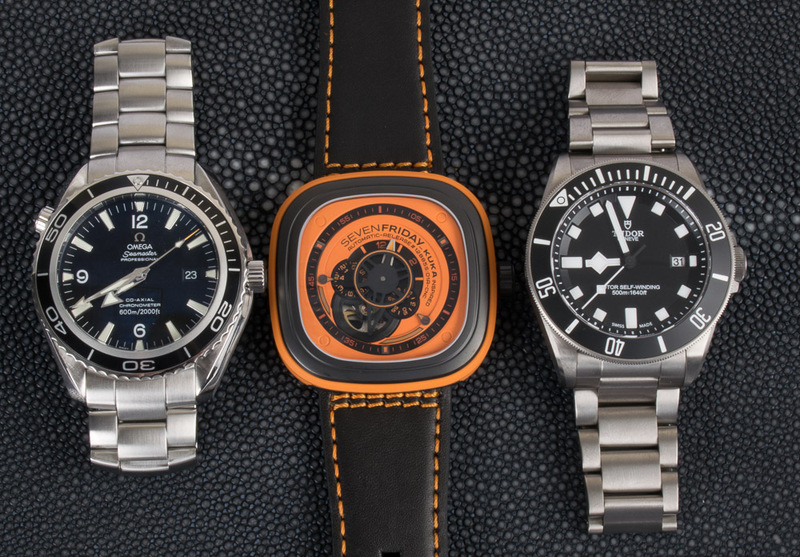 Looking at these 3 watches side by side reminds us that the SevenFriday’s curved edges also help the size appear more modest than its dimensions suggest. 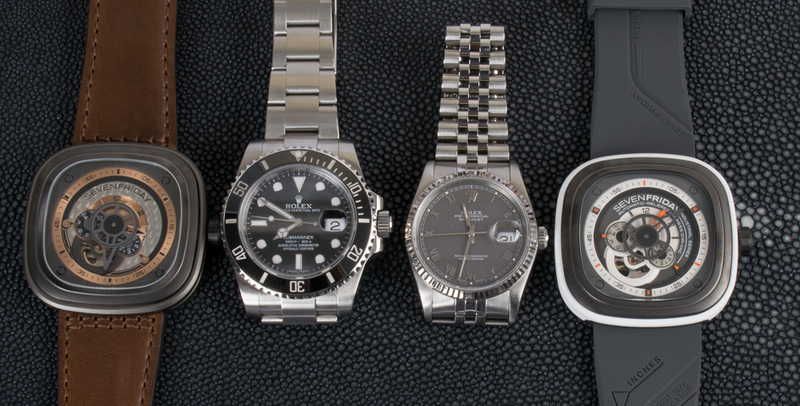 One last shot, with the 116610 Sub again, plus a big Graham Silverstone Vintage 30 that rocks 47mm width and 55mm height. 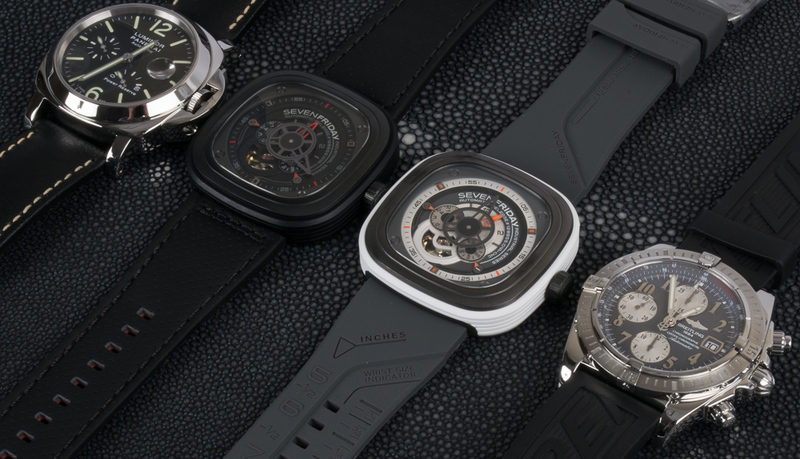 If you visit SevenFriday’s website you can find “Print and Try” PDFs to print out 1:1 of the watch of your choice. 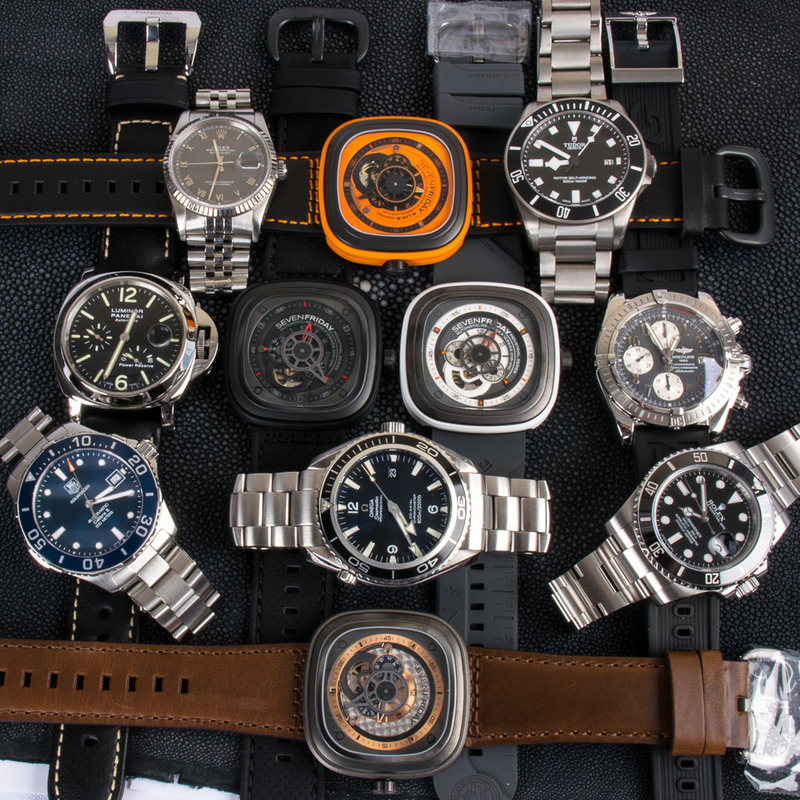 Cory Berry is an internet jack of all trades and has been highly involved with Swiss watches since 1996 when he began working for Bernard Watch. He has learned a lot about the Swiss watch and internet industries in that time. and has witnessed brands rise and fall, seen watch close-outs come and go, and observed many trends. At Bernard Watch, Cory helps customers find the right watch (or watches) for their wrist. He designed and manages BernardWatch.com. He enjoys writing about watches and managing the company’s social-media properties. That’s a diverse group you’ve got there. Great read.